October is Eat Better, Eat Together Month, which is all about taking time out of everyone’s busy lives to sit down together and enjoy a healthy meal. It would be great to be able to do this all the time, but life gets in the way, and it can be hard to balance everything while taking the time to sit down and enjoy a healthy dinner. We compiled a list of easy, quick and healthy meals that will allow you to make time for your loved ones. As the weather starts to cool down, it’s the perfect time for comfort food. This healthier version of the southern classic doesn’t use sticks of butter, which means you can feel good about indulging. With prep and cook time combined, this meal is ready in 30 minutes, so you can make this any night of the week. See the recipe on the Food Network website. This deconstructed lasagna gives you the same fulfilled feeling after eating without all the prep time required for normal lasagna. The original recipe is vegetarian-friendly, but if you would like to add some protein, you can sauté up some ground turkey for a quick and easy addition. This one comes together and is on the table in 25 minutes. See the full recipe on the Eating Well website. Kids are notoriously picky eaters, which can make it hard to get them to eat healthy meals. Here’s a super-cheesy mac and cheese recipe that gets them to eat healthy while enjoying one of their favorite meals. This recipe comes together in 25 minutes and adds broccoli (or whatever vegetable you choose). You can round it out and add protein like chicken to make it a full meal. See the full recipe on the Eating Well website. During the colder months, the slow cooker is your friend. This recipe can be thrown together in 15 minutes before you leave for work and be ready by the time you get home. It also has plenty of protein, 35 grams per serving, while keeping the calorie count low for those watching their weight. The ingredients make this meal as hearty as it is healthy. See the recipe on the Cooking Classy website. Family time around the table is a great time to catch up on everyone’s days and share a few laughs with those you love, but you may not always have time for that. Taking the time to plan easy meals like these ahead of time can be a simple step that helps you get this precious time to spend with your family. 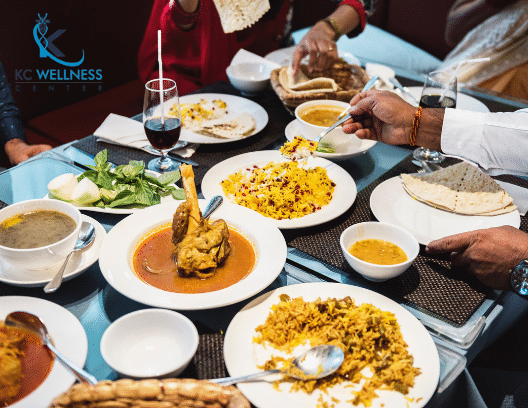 In the process, you can ensure that everyone in your family feels their best by taking care of their bodies with healthier meals. Skip the take-out and make better choices for you and your family this month for Eat Better, Eat Together Month. If you’re looking for help with weight loss, check out our medical weight loss program. To set up a consultation, call us at 816-214-5276 or visit https://bit.ly/2NCVgxr. Posted in Uncategorized and tagged Comfort Food, Cooking, Easy Meals, Easy Recipes, Fall Food, Fast Meals, Fast Recipes, Food, Health, healthy, Homemade, Kid Friendly, Kid Friendly Recipes, Recipes, Weeknight Dinners.